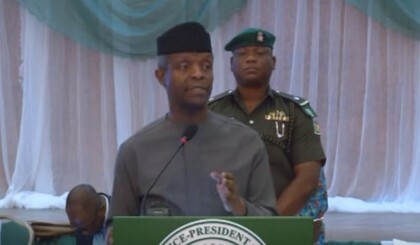 Here is a summary of the executive order on ease of doing business in Nigeria signed last Thursday by the Acting President Prof Yemi Osinbajo. The Order promotes transparency by directing that Ministries, Departments and Agencies (MDAs) of the Federal Government of Nigeria (FGN) should publish a complete list of all requirements for obtaining permits, licences and approvals, including fees and timelines, in their premises and on their websites within the next 21 days. The Order also directs that MDAs must communicate with applicants by at least two methods, and any approvals for applications not received within the specified period will be assumed to have been granted to the applicant by default. Any rejections must be given with valid reasons. The Applicant whose application is deemed granted after the expiration of the application period can apply to the supervising Minister to issue any document or certificate required. Importantly, it is the responsibility of the head of the relevant MDA to ensure that the list is verified and kept up-to-date at all times. If there is any conflict between a published and an unpublished list of requirements, the published list shall prevail. The Order directs that MDAs must communicate with applicants by at least two methods, which will be made known to applicants. Any approvals for applications not received within the specified period will be assumed to have been granted to the applicant by default. Any rejections must be given with valid reasons. The Applicant whose application is deemed granted after the expiration of the application period can apply to the supervising Minister to issue any document or certificate required. The applicant’s acknowledgement copy of the application, including electronic submission acknowledgements, shall serve as proof of the date of submission of the application for purposes of determination of the commencement of the application timeline. To simplify application processes for Nigerians, the Order promotes a “One Government” policy. No private applicant will be asked to produce or submit a document issued to it by the FGN as part of an application process if an original of the document is in the possession of another FGN MDA. A photocopy will be sufficient. Instead, FGN MDAs are now required to bear the responsibility of seeking verification or certification directly from the issuing MDA. With specific reference to travellers to Nigeria, visas will be issues within 48 hours and the processing of issuance of visas on arrival shall be carried out in a transparent manner. Our airports and sea ports are not excluded. There will now be only one centrally located interface for agencies and touting has been strictly prohibited. Any official caught soliciting or receiving bribes from passengers or other port users shall be subject to immediate removal from post and disciplinary as well as criminal proceedings in line with extant laws and regulations. All agencies currently physically present in Nigerian Ports have been directed harmonise their operations into one single interface station in one location in the port and implement by a single joint task force at all times. The Apapa Port shall resume 24-hour operations within 30 days from today and each Port in Nigeria shall assign an existing export terminal to be dedicated to the exportation of agriculture produce within 30 days of this Order in order to jumpstart our international trade and economic activity.